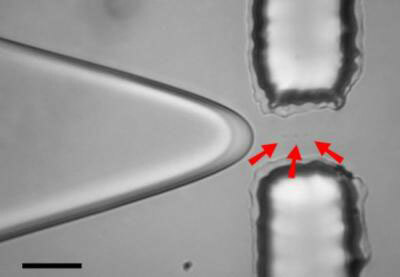 (Nanowerk News) Inventing a useful new tool for creating chemical reactions between single molecules, scientists at the National Institute of Standards and Technology (NIST) have employed microfluidics—the manipulation of fluids at the microscopic scale—to make microdroplets that contain single molecules of interest. By combining this new microfluidic "droplet-on-demand" method with "optical tweezers" that could merge multiple droplets and cause their molecular contents to react, the research may ultimately lead to a compact, integrated setup for obtaining single-molecule information on the structure and function of important organic materials, such as proteins, enzymes, and DNA. The droplet sizes are highly uniform and can be tuned by adjusting the width of the constriction. With this technique, the researchers made droplets about a micrometer in diameter—or half an attoliter (half a billionth of a billionth of a liter) in volume. In the microfluidic channel, the water is laced with desired molecules of just the right concentration, so that resulting droplets each pick up on average just one molecule of interest. Inside each droplet, the individual molecules of interest slosh around freely in the relatively roomy sphere, along with the water molecules that make up the bulk of every droplet. By using laser beams, the researchers can move two or more single-molecule-containing droplets, cause them to coalesce, and observe the reactions through optical methods. For their initial reactions, the researchers are mixing fluorescent molecules that emit different colors, but in the future, they envision more interesting chemical reactions, such as those between an infectious agent and an antibody, or a chromosome and a drug. The researchers can shape a laser beam into any desired pattern and thereby trap not only single drops, but arrays of them, opening up new possibilities for single-molecule spectroscopy. * C. López-Mariscal and K. Helmerson. Optical trapping of hydrosomes. Proc. SPIE, Vol. 7400, 740026 (2009).